Sakura fox and Mercury are huge inspirations. They’re great fursuit performers, cool people, and way cute. They’re the kind of furries who make this subculture awesome. They’re Texas-based but well known around cons. I’ve seen them present con panels about “Renegade Fursuiting.” Sakura has a series of FA journals about it that are recommended reading. Without comparing notes, we have come to similar conclusions that taking it to the street makes a unique experience beyond the usual. 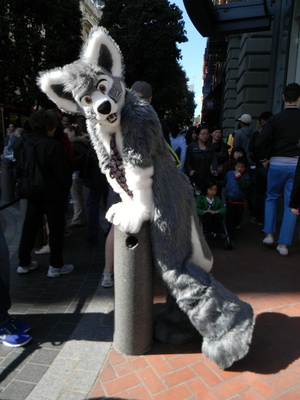 (I’ve called it “Street fursuiting” and the “theatrical soul of furryness”.) Whatever you call it… let’s find out how fabulous foxy friends bring the magic. Hi Sakura! Your FA page says your age is 2. Can you give a brief bio about your foxy life so far? Hi Patch! Lucky and Scuff of Don’t Hug Cacti built Sakura for me about two years ago. I had a burgeoning fascination in fursuiting, and I realized that I’d never have a chance to truly explore the experience unless I gathered my resources and took the leap to commission. For most of us, it takes about a year of waiting between having the concept and actually putting on a costume. If I wanted to start next year, I had to act now. The real me was almost 30 before I put in a commission. One of the beautiful things about costume performance is that it’s blind to the person within. I’m so proud of everyone who has the capability and imagination to start costuming earlier in their lives– they’re so much more experienced and excellent performers than I am at this age! I started with small local events, a few brave adventures outdoors around the city, and eventually scouring the local community event calendars every week for any event that might be ‘suitable’ for fursuiting! I’ve yapped with you (and traded hugs) more than Mercury. You two seem inseparable, do you share a fox den? Do you always go out fursuiting as a team? If you do, does your team-up work well enough not to need a handler? Or do you prefer to join other regular friends or meets? Do you have any thoughts about suiting with others? I fursuited at an Anime convention two summers ago, and Mercury met up with us. He asked if he could try on Sakura when I was done, and we traded places for a while. He immediately became just as hooked as I am! He wore Sakura a few more times at later events, imagined the character Mercury, and also commissioned from DHC shortly thereafter! We’re dating and we make a great team. 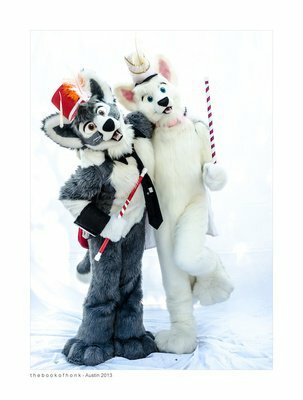 A good fursuiting buddy will be brave, challenge you, explore and teach you new techniques, and bring new opportunities to practice and perform. A good buddy will also watch out for you, be attentive and aware of surroundings, and help with logistics and safety issues which surround public fursuiting. Mercury is all of these things. As an added bonus, our suits are super similar and we make a fantastic team visually! Some situations are more safe; they’re known environments with like-minded crowds, a festival atmosphere, and some support towards your activity. Conventions are a good example. If you have good vision, sure footing, spacial awareness, and keep close watch on your buddy, you might try to carefully head out in pairs without a spotter and be successful. We’ve attended parades, fairs, art shows, conventions, and other events as a pair in fursuit, without incident. We chose events carefully, scouted the location in advance, and packed our own water. It’s possible but not recommended, because it is more dangerous and a lot could go very wrong. I love fursuiting with other performers because it can be more magical and less threatening for performers, participants, and bystanders alike! In exchange, it’s more difficult to mobilize and logistically more complicated. Mercury and I generally prefer to keep the group small for flexibility and mobility. Austin has a lively fursuiting community but we tend to appear and disappear from local events mostly unannounced. More soon in parts 2 and 3. A whole world of topics extend to those of us who are commissioning, traveling with, and performing in costumes. I will be doing some journals soon about spotters… fursuit design choices (White feet? bad idea for longevity. Weird colored paws? Good luck getting replacements when they wear out.) More types of cooling gear (water circulating shirts, fans)… how to logistically change in locations without a changing room (we have some techniques with the car that work well). My goal with the Fursuiting Tips journals was to start outlining panel ideas and actually outline what could become chapters some day. With some time, there is a lot more to be said about those topics and more. See also my previous article responding to Sakura’s journal – Fursuiting and copyright: an important issue for fandom.